I know, I know. After the 2012-2017 Great Equivalence War, photographers everywhere agreed never to utter that word again. Nasim’s famous quote, “Everyone is right, everyone is wrong,” has been etched both into the peace treaty and into the hearts of millions. However, as we near the two-year anniversary of the ceasefire, it seems that isolationist thoughts – i.e., that equivalence is isolated just to focal length – are resurfacing again. Let’s stop this madness before it’s too late. Note: On Photography Life, we already have a very detailed article on equivalence here. It goes into things like print size, pixel density, diffraction, and the ugly duckling of “total light.” Feel free to read it if you’re interested in those topics. 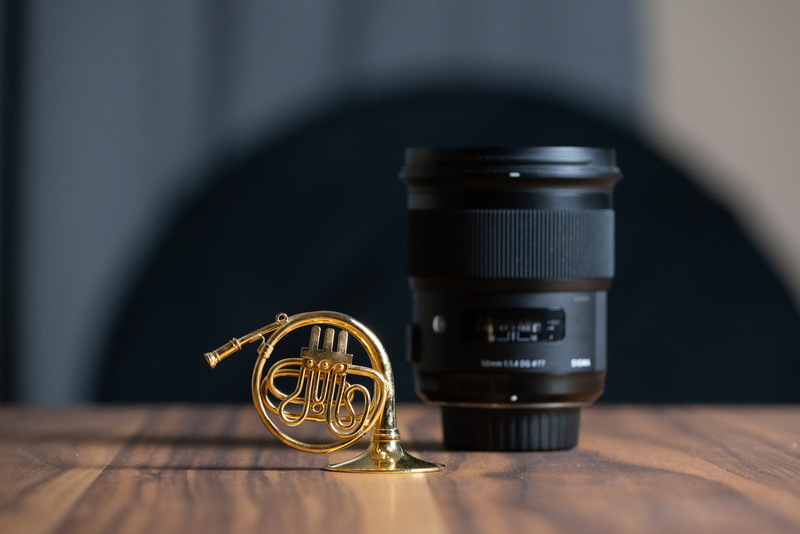 The article below is limited in scope simply to focal length, aperture, and ISO – the three key takeaways from the equivalence discussion that I think everyone should know. That’s my true reason for writing this article: to emphasize the three important takeaways of equivalence. Quite simply, now that we’ve entered a bit of a cool-down period on the equivalence debate, it’s become a good time to turn back and examine it with rational heads. There are useful things to be gained from equivalence. It directly matters any time you try to recreate the look of a particular image (such as an inspiring portrait photo you saw online), or when you’re deciding among camera systems in the first place. Before we start, what is equivalence? Quite simply, it’s the way you can take similar looking photos with two different cameras – two cameras of differing sensor sizes, to be more specific. If you want to take equivalent photos with a Nikon DX crop-sensor camera and a Nikon FX full-frame camera, you’ll need to do a few calculations. (They aren’t hard, and I’ll cover them below.) Sure, a thousand little differences mean that your photos will never look identical even after you get the math right. But when you get down to the essence of equivalence, that’s all superfluous. Instead, you’re left with only three variables still standing: focal length, aperture, and ISO. All of equivalence – all of it – assumes that you don’t move your physical position. Equivalence goes completely out the window once you start moving. That’s because any time you move, you change the relative sizes of objects in your photo. This is called perspective, and it’s a cruel force if equivalence is your goal; with different perspectives, it just isn’t possible to capture two identical photos. So, the entire discussion below assumes that you’re standing still, because otherwise you might as well be reading a completely different article (like Elizabeth’s on lens compression). The formula for equivalent focal length is easy: (focal length) x (crop factor). For example, a 100mm lens on a 1.5x camera is like a 150mm lens on full-frame camera, at least for field of view. Hopefully this fact is already second nature to you. Things get a bit more complicated – though not much – if neither camera in question is full frame, just because math like “1.5x crop” is assumed to be relative to full frame. For example, say that you’re trying to calculate equivalence between an APS-C and medium format camera. In this case, you need to look at the ratio of their sensor diagonals to find the crop factor between the two. Uncropped image, APS-C crop sensor (Nikon D7000), 100mm. A lot of photographers stop here, but that’s not good. As you can see in the images above, even though the fields of view are identical, depth of field is not (which will be more visible in the next section’s photos). That’s because aperture is also part of equivalence – and so is ISO. Before I go into any details, let me simply mention one thing: the formula for equivalent aperture is exactly the same as the formula for equivalent focal length. Just do (f-number) x (crop factor). To take equivalent photos, you’ll be at f/4 on a 1.5x sensor alongside f/6 on a full-frame sensor. While I’m at it, I’ll mention another thing: this is only talking about depth of field. If you don’t also do the next step (the ISO side of things), the f/6 photo will be significantly darker. And this only applies when your fields of view are matched already – after you’ve zoomed in with the larger sensor. Clearly, the first image has a shallower depth of field. So, when you crop your photos by using a crop-sensor camera, you need to do something about the depth of field problem. Otherwise, you just can’t get equivalent images. As I said a moment ago, the exact fix is (f-number) x (crop factor). 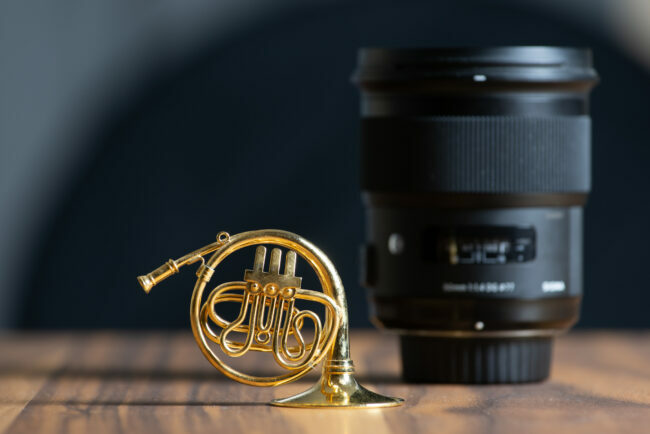 You now have two photos from different camera sensors, yet you’ve managed to capture the same field of view and the same depth of field – not bad. At this point, the obvious difference is that one photo is darker than the other. Specifically, the larger-sensor camera is now capturing underexposed images, which is no surprise, since you decided to use a smaller aperture on it. What were you thinking? Clearly, you were thinking that you can just raise the ISO on the large sensor camera to compensate. Most likely, it already has better high ISO performance than the crop sensor, so it works out to be roughly an even trade. And you’re quite right to think that. 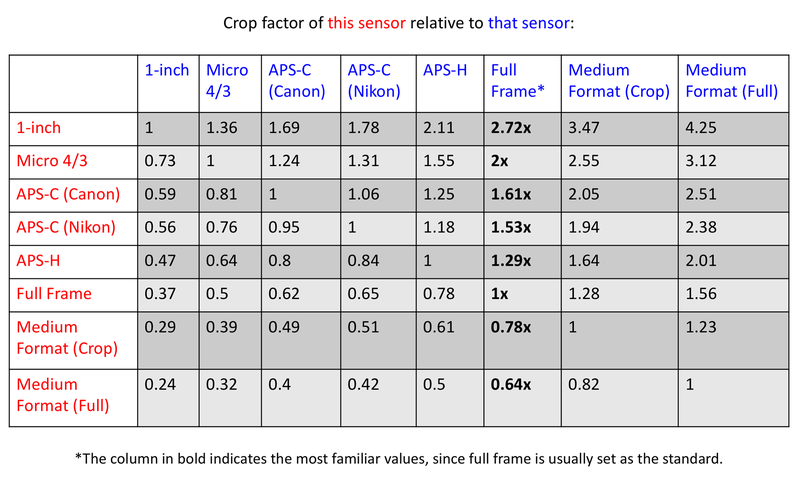 In fact, let’s revisit the 2x crop sensor example. Your apertures in this case are f/4 and f/8, as I showed a moment ago. That’s two stops of difference. And, by actual magic, full-frame sensors are about two stops better in high ISO performance than 2x crop cameras. On 1.5x APS-C sensors, that’s f/4 and f/6, roughly 1.3 stops of difference. Who would have guessed? 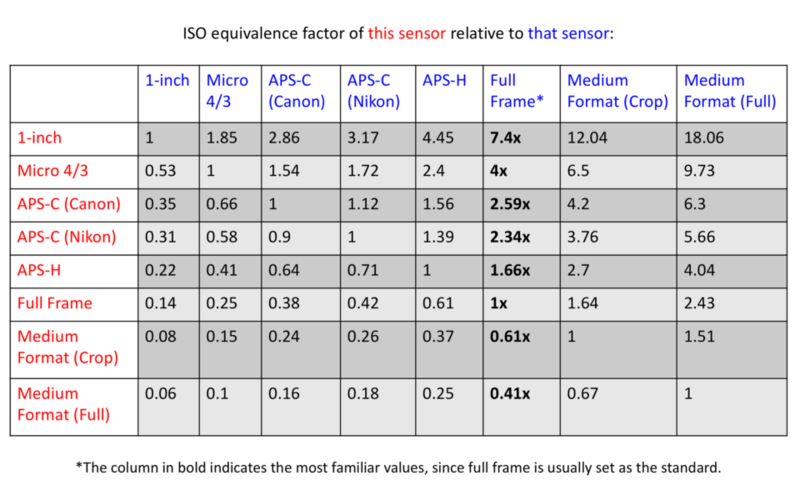 Full-frame sensors are about 1.3 stops better than APS-C sensors at high ISOs. Also by magic. On the rare 1.3x APS-H Canon cameras, that’s f/4 and f/5.2, a little less than one stop of difference. Hopefully, it’s no surprise to hear that Canon’s APS-H cameras performed about one stop worse at high ISOs versus the company’s same-generation full-frame cameras. So, what’s the underlying formula here? It’s similar to the first two, although slightly more complicated. In order to factor ISO into equivalence – thus fixing differences in brightness and noise performance – the equation is: (ISO) x (crop factor^2). As you can see, you need to square your crop factor first. For example, this leads to equivalence between f/4 and ISO 1000 (on a 2x crop camera) compared to f/8 and ISO 4000 (full-frame). Or f/4 and ISO 1000 (1.5x crop camera) versus f/6 and ISO 2250 (full-frame). You get the point. The ideal settings would have been f/5.2 and ISO 1367, but those aren’t values that the D7000 can set. Instead, the closest approximation was f/5 and ISO 1250, which is still similar enough that the photos look equivalent. Noise levels are pretty much the same. Small differences aren’t a surprise – and there are a few here – but overall these photos are as equivalent as they can be. There’s a reason why photographers pay top dollar for lenses like the Canon 50mm f/1.2 or Sigma 14mm f/1.8 with a full-frame camera. Companies simply don’t make 35mm f/0.8 or 9mm f/1.2 lenses for APS-C crop sensor cameras, which is what it would take to achieve equivalence. Even if those lenses did exist, most crop-sensor cameras still lack ultra-low ISO values. 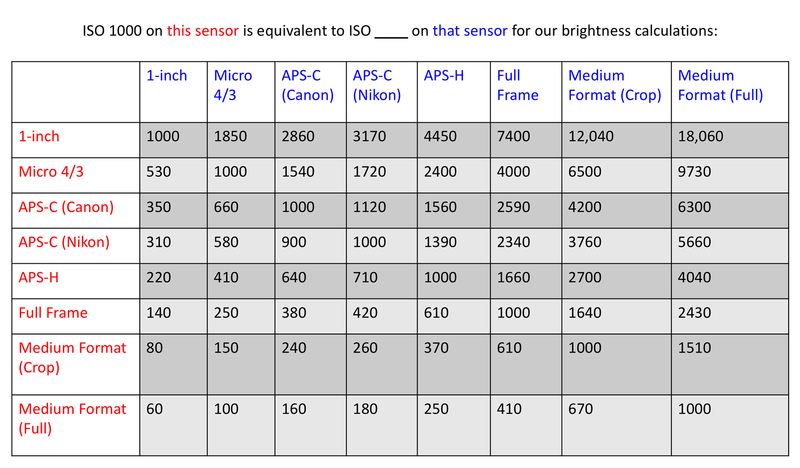 So, if your large sensor is at base ISO, you probably can’t do the ISO part of equivalence; the small sensor simply can’t go low enough to compensate. Instead, you’ll have to set it to base ISO as well, and darken the photo as needed with a faster shutter speed. That makes the photos look equivalent at a broad level (field of view, depth of field, and brightness). But since you’re at base ISO on both cameras, the large sensor is likely going to win in terms of things like dynamic range and color depth. As a side note, smartphone manufacturers have tried to get around this by using a low base ISO of around 25 on many models. However, standard smartphones have tiny sensors with a 7x crop factor versus full-frame. That leads to an equivalent ISO of 25 x 7^2, or about ISO 1250. Next time you wonder how much image quality you give up with a phone, remember that the best case is like shooting all your DSLR images at ISO 1250. 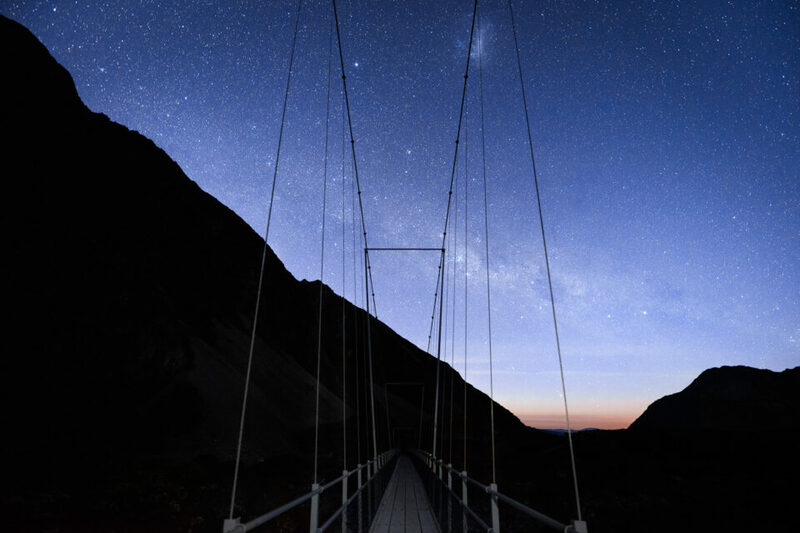 Taken at 14mm f/2.8 on a full-frame sensor. 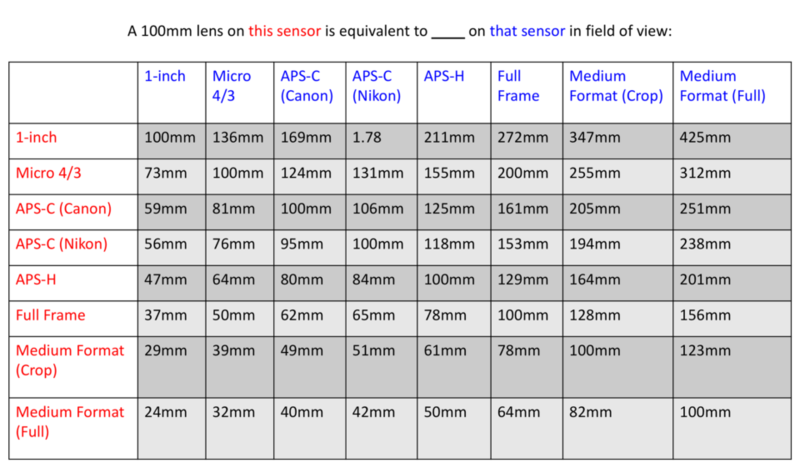 For equivalent photos on an APS-C sensor (1.5x to 1.6x crop), you would need a 9mm f/1.8 lens, which currently does not exist. I was pressed for time here, so I shot this handheld at 20mm, ISO 800, and f/5.6 on full-frame. Other than the 4×3 aspect ratio, a Micro 4/3 image taken at 10mm, f/2.8, and ISO 200 would be theoretically equivalent – in field of view, depth of field, and exposure, without sacrificing image quality. Plus the camera would have weighed less, so I’d have made it here quicker and had time to set up a tripod! You need to apply all three in order to get an equivalent photo. Don’t misinterpret that I’m saying “ISO 200 on M4/3 is the same as ISO 800 on full frame.” It’s not. Hopefully this goes without saying, but any side-by-side test will show ISO 800 to be brighter than ISO 200. However, if you want equivalent photos on both these cameras, you’ll need to shoot your full-frame sensor at twice the focal length, twice the f-number, and four times the ISO. To me, that’s the takeaway that matters in the equivalence discussion. You can debate all day about sensor efficiencies, lens T-stops, X-Trans vs Bayer, CCD vs CMOS, and a million other things. But if you don’t at least take into account focal length, aperture, and ISO, you’ll never get equivalent photos across different camera systems. I do want to emphasize that equivalence is rarely something you’ll need to think about in the field – but it does matter a lot in certain non-field cases. 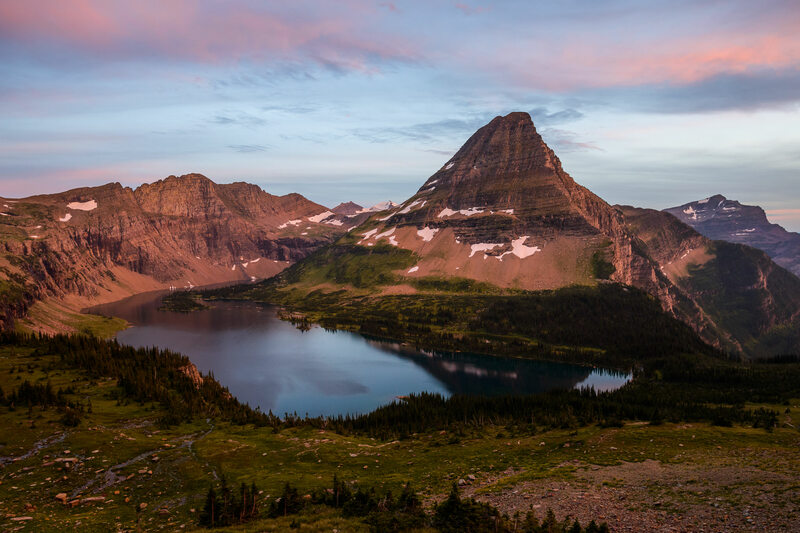 If you see an amazing photo and wonder how to get the same look in your images, just do some quick calculations to figure out the right settings. Or, if you’re deciding between two camera systems, it helps to know exactly what you’re giving up with one versus the other. On top of that, I believe that learning the advanced technical side of photography makes it easier to internalize the basics, something that directly impacts the quality of your photos. I also don’t want photographers to waste their time in forum arguments if there is any way around it. Hopefully, a math-based understanding of equivalence, especially the main takeaways, will help you avoid that fate – or, if it’s doomed to happen either way, at least dominate the discussion boards and prove to everyone that you’re the Best Photographer™. Equivalence? Is that this kind of delusion everybody has the only single correct opinion about? Calculating the factor between smartphone camera and medium format sensors? I already thought, it’s only a subject for photo-theorists wanting to show off… wake me up, if something starts to become helpful in this discussion. Instead, it’s important any time you want to capture a certain type of “look” you see in a photo (like those Lisa Holloway portrait photos that went viral on 500px a few years ago… I think she’s who I’m thinking of). 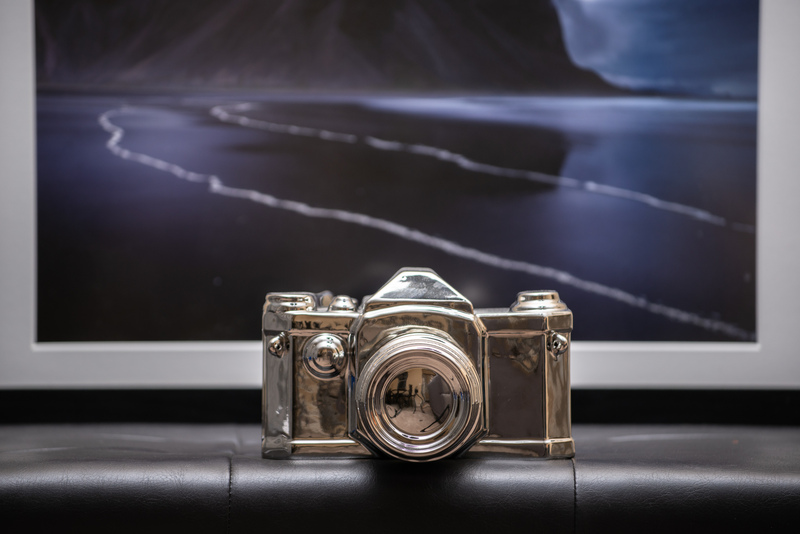 The photos have a unique look thanks to their subject isolation, and it’s reasonable for photographers to wonder what equipment they need on their particular system to capture something similar. Or, it’s useful for photographers to know what they’re giving up if they’re deciding between a 25mm f/0.95 lens and a M4/3 camera versus a 35mm f/1.8 lens and a Nikon DX camera. In this case, the answer is that they are actually gaining about two thirds stops in low light with the M4/3 system. Anyway, just trying to say that some photographers find practical value in this sort of topic, or it wouldn’t be so popular to talk about online. Not all do – and rarely in the field – but I’d say it’s worth one last crack at a simple explanation. My problem with equivalnece is, that methodical mistakes like your donwsampling of a 36 MP sensor to 16 MP adds the disadvantage of interpolated pixels to FF, then it’s rather easy to conclude “oh, all that FF things are purely mumbo jambo, I can get the same results with APS-C”. Tell me why don’t you upsample the APS-C sensor? You treat it as if it’s simple multiplication and I say, it’s not. Next thing is the simple fact that hopefully no one pays for a 36 or 46 MP sensor to do equivalencing games. As long as you stay in tele-range differences are not too visible. Use wide-angles, check for resolution at 100% and you see where your money went. What I also dislike is the reduction to DoF for apertures. Regarding only DoF and ignoring the combination of f/1.4 gives you the same shutter speed at the same ISO puts too much weight on DoF and not enough on “can I get an unblurred shot?”. To me, equivalence remains theoretical math. It’s good to know and it’s also good you point out the other factors adding to the equation. But in real life I take the photograph with the camera I brought and don’t care what settings would equivalence to. I also took part at some equivalence wars and the outcome was never worth the effort and the lost nerves. Thanks for this article. I used Canon 5D III/IV for many years and developed my own “style” for landscape photos. When I bought a Olympus OM-D E-M1 Mark II, I wanted to continue to shoot the “equivalence” of my shooting style with the Olympus. So I can understand the purpose of your article. In theory, it would be interesting, according to which maths ISO 1250 become 3200 if multiplied by 1.5. But then you already have to downsample images (with only low frequencies in) to get “comparable” pictures. Downsampling will alter each equation, as it is not part of it. Being not part of it, makes the equation wrong, just saying. Sure, not going to argue about the popularity of this topic. I know it’s a big one, although I did try to temper the article above in favor of a constructive rather than a reactionary discussion, even if the click number may be lower as a result. More to the point, I will say that the downsampling is inevitable any time you’re comparing different sensor resolutions, not just in terms of equivalence. It doesn’t invalidate this discussion any more than it does the others, like the Z6 vs Z7 high ISO comparison in our Z6 review. I just as well could have used a 24MP full frame and crop sensor here, but didn’t have one at hand. Either way, the two images are equivalent regardless of downsampling. Same field of view, same depth of field, same exposure, essentially the same noise performance (as close as these sensors are going to get with the 1/3-stop ISO values each one lets you set). It’s easier to see all the similarities when I downsample, but that doesn’t mean they only exist when I downsample. Yes, it DOES invalidate this discussion. 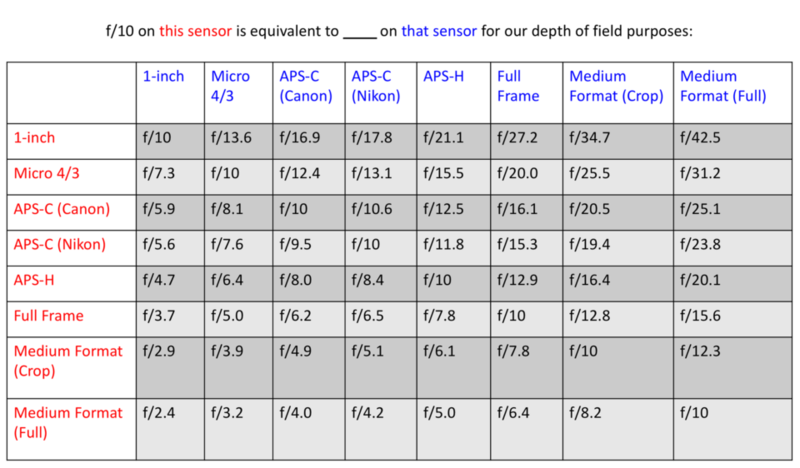 Trying to calculate equivalence on different sensor resolutions is crap, as simple as that. It’s no better than to forget to equivalence aperture and ISO as well. You made two mistakes, one with downsampling from 36 to 16 MP (36/16 = 2.25, so Photoshop has to interpolate and fill in 1/4 pixels. Which it can’t without getting softer results. It’s rather bad methodology, Spencer. If you want to downsample something then two pixels have to become one, or three, or four, but not a decimal. Mistake number two: ISO 1250 × 1.5 = ISO 1875, NOT ISO 3200! In fact, if you say these 100% crops were similar, then it’s really bad for APS-C, because you tried to get FF the disadvantage of nearly 1 stop higher ISO. This kind of careless playing with variables, ignoring some, disobeying others characterizes all equivalence discussions. That’s one of the reasons they keep repeating over and over again with no useful outcome. You tried to do something good but you stepped into the obvious traps. You can’t blow up a Porsche 1.5 × and expect it to speed 450 km/h. Why is all so depending on the equiv. numbers? With smaller sensors, tele ranges are easier to do, with bigger sensors wide angle photos benefit a lot – it’s no single sensor to rule them all. So why even care? There is no sense in calling the article useless and then making a big mistake that I directly address in a full section of the article. Yeah, ISO 1250 x 1.5 is 1875. But we’re dealing with 1250 x 1.53^2 (aka 1250 x 2.34) because that’s the whole concept of including ISO in equivalence. And that equals 2926, which, while not 3200, is the closest we can get with the 1/3 stops available on the D7000. (Next one would have been 1600 x 2.34 or 3774). All that is explained above. I didn’t call the whole article useless and I’m sorry if that appeared to you to be the case. The ISO concept came from film, Spencer. On film you get higher ISO with increasing the silver crystals – no sensor increases pixel sizes when higher ISO are in demand. Therefore simple squaring of the crop factor is nothing else than guess work. While crystals grew in area at higher ISO, pixels don’t, even if that’s not fitting your simplified equations. These days it’s an analogy for an amplification of signals coming out of a sensor. And this is where the next trap lurks: A couple of sensors these days have two different circuits, one for base ISO 64 i.e. and the other takes over at higher ISO numbers – don’t recall the exact value of the D850 sensor. Now, for which circuit you try to find an equivalent crop or smaller sensor? I say, sensors are already very different and for sure not made for “equivalencing fun games” but to get the best IQ out of it. Which doesn’t stop after the sensor, processing is the next step – what we get as “raw”-data is already modified. In one or another way. And since the article makes no difference between old sensors with lower dynamics and contemporary sensors with a bigger DR (and better or optimized noise patterns), I see it as impossible to get two sensors in various size but with exactly the same noise and dynamic behaviour. You also cannot “equivalence” long time exposures, because no two sensors have the same temperature characteristics. Of course, one can omit one or the other detail in all these equations of various variable with various characteristics of their effects. But then, what’s the diff if others do the same with operators which are more important to you? Some simply want to know which FL on FF is roughly equiv. to a FL in front of a smaller sensor. And the Earth will not stop turning if the new guys in the art of “fighting for proper equivalence” repeat the same mistakes we all made before. As I see it, camera manufacturers try to keep the fog curtain ( = marketing blurb) active, so no need to blame people who don’t know better. But what really annoys me, are this stupid captchas on dope this site is using. In terms of the rest of your points, I don’t disagree – comparing two same-megapixel sensors would be better. But I didn’t have two on hand, and anyway, we compare different-megapixel sensors all the time by downsampling the larger one. Again, pretty much all the ISO comparisons on Photography Life (and many other websites) are done this way, and I don’t believe it invalidates the results. Your most important point in my opinion is your last – that different sensors are ideal for different purposes, and it’s a waste of time to worry about things like equivalence if they don’t directly impact your work. Their is no magic in this, this is also geometric. The only thing you have to to understand is that noise mostly comme from photon noise (in most photograp we take, except in the deep darks) and not sensor noise. Therefore the SNR of an image is dictated by the quantity of light per image resolution element. What is the resolution element ? The part that you can resolve with your eyes on a photograph you are contemplating. The further you look at a picture (or the smaller you print) the bigger will be these elements relative to the image -> so higher amount of light -> better SNR (and less resolution). Everybody experienced this. Now take the same image with different size sensor, if one is 4 time smaller (in area) than the other you will need to concentrate the same quantity of light in a 4 time less surface area to conserve the same SNR per resolution elements of the final product. In other word the size factor between resolution element of the contemplated photo and on the sensor change. If you change the concentration of light, you change exposure so you need to change ISO. This is geometric. An other way to simply see the problem : if two systems have the same field of view, one condition for them to have the same SNR is that they have the same pupil size (because the same quantity of light). A 50mm f/2 does not have the same pupil than a 33mm f/2 by definition so a different SNR (whatever iso is used). The goal of equivalence is mostly a help to compare global system performances over their price. No really to take picture. Including iso in the equivalence is confusing even if mathematically correct. iso has little to do with performances or artistic rendering (like d.o.f) this is just a gain. Thanks for the geometric explanation of the ISO equivalence, Sly! And certainly the answer isn’t magic – as I’m sure you know, my intent there was to imply lightheartedly that all of this is connected, all of it can be understood, none of it is arbitrary. Photography has some truly interesting math behind it at times. The ISO side of things, you’re right, can be confusing – but if we didn’t make brightness equivalent via ISO, what would we use? Shutter speed? Then, noise performance of the sensors would be quite different, and you couldn’t get equivalent photos any time the subject was moving. So, it’s almost a necessary evil in this discussion. The thing that bother me with the equivalence with ISO is that you are putting apart the dynamic range when you do that. You may blow up some highlights when increasing iso for equivalence and end-up with a non equivalent photo. In a photographic condition I would put apart the iso as still the photographer may decide to increase it or do it in post to conserve the contrast of the scene (and end up with equivalent photo). I have to think about it but I do not think we can express an equivalence for maximum DR as it depend of the tech and not only the geometry. However, at equivalent setup (without including iso), large sensors have an advantage of maximum D.R. simply because you are diluting the same quantity of light on a bigger surface and that pixel have a limited depth. This is also geometric. Excellent article, it is VERY helpful and insightful. It is nice to have a simple article to which you can refer people who genuinely want to learn something of practical value about the concept of equivalence. Thank you Spencer. Thanks, Kent, glad you liked it. There truly are notes of practical value to be gained from equivalence, in my opinion. (Hopefully that would be the case, given the amount of effort people put into talking about it!) I think it’s easier to examine this discussion from the starting point that focal length, aperture, and ISO are all part of equivalence. Add on things like signal-to-noise ratio, pixel density, demosaicing algorithms, etc., at a later time if you want to explore it deeper, but always keep the fundamentals in mind. I’m happy you thought so, John. It doesn’t all have to be complicated or brand-war-ish! This my first look at the subject. Wouldn’t two images need the same resolution to be equivalent? I think you can have your answer by looking a picture on title screen of the back of your camera and looking on the big screen. Or looking on a screen and stepping away. I guess you will see more noise on the big screen and les resolution. This simple fact tells you that you need to *see* the picture at the same resolution to compare them, whatever the original number of pixels used to take the photo was. A suggestion to the author, Spencer Cox or to anybody writing on this topic. When talking about purely crop stuff, … do not compare using an actual APS-C and Full frame camera just use the same camera and crop what ever you want out of it (build your APS-C camera with a FF), use your equivalency, show the picture at same size and you will get *exactly the same result*. This way you can avoid the pixel size, iso performance, …. talk since this is the same sensor. Using one single camera but two (equivalent) lenses and sensor surface. The real problem is that there is little ‘equivalence’ between the internet based photography ‘Influencers’ (who have huge YouTube followings, are flown around the world to comment on new gear, and just make stuff up about photography technique and technology as they come across it to get more clicks), and experienced professional photographers, who know that there are no shortcuts in photography. THIS! This is the only reasons you need to even think about equivalence. It isn’t “omg my system is better than yourz”, it’s mainly so we can have some sort of standard to achieving similarity and moving between system. When I first got into photography, I went with the m43 system because of weight, but I got blindsided by the “equivalence warz” and almost decided I had to go full frame. Years later, I am so happy with my prints from my m43 still, and never moved on to full frame. I have a variation of photos printed, from sports, portrait, street, to landscape, all of it shot on m43 printed up to A2 to A3 sizes. I came to the same conclusion as quoted a few months ago, and happily just enjoying the system I’ve invested on instead of going to GAS (gear acquisition syndrome) every time a review is posted on new hardware. It is funny how equivalence is so hard to grasp for most people today while, for much of film photography history, 35mm coexisted with a large number of other film formats (or did not even exist yet) without triggering such flame wars (ok, Internet did not exist back then). Fine article and useful. I have been using the same lenses between formats for many years. I remember back in the old days of film when I had all Pentax equipment, including a 6×7 and 35mm equipment. I could use the adapter to fit the 6×7 lenses on my 35mm SLRs. We did the math to figure the (equivalent) focal length. This was very helpful in determining which lenses to use for various situations. The silly controversy over whether this is technically correct or not amounts to a bunch of nitpicking. Who cares if I say I got 450mm out of a 300mm lens with a DX camera? We have a lot more serious issues in the world than worrying about that! I just boil it down to being a matter of using different formats, rather than thinking of one format being simply a crop of another. That can be said about every format from large format cameras on down to the smallest. If something, like using equivalency, helps me picture what result I am going to get using lenses in more than one format, then I am going to use it and phooey on anyone who objects. They are welcome to do their own thing, but can’t tell me how to do things. So be it! Thanks for this thorough article, and the tables. I’ve never really thought about ISO entering the equation. To me it is a matter of changing the shutter speed. And since most of my subjects (and all of your examples) are static, changing the shutter speed seems to make a lot more sense to me than altering ISO. But I understand where you are coming from. Oh boy, how am I reminded of a big discussion I read elsewhere when it was suggested that current crop MF sensors aren’t noticeably better than a FF sensor with a base ISO of 64. I wasn’t particularly shocked myself as I already knew, mostly, the relative equivalence factors but this explains it much better. I’m taking my first shots on a FF sensor these days and just today I took a shot at ISO 1250 and was fairly shocked at how clean it looked. On my d3200 I avoided going above ISO 800 unless I really had no other viable choice, I have to say it’s fairly liberating (then again, I’m probably too pessimistic about how bad noise actually is in my pics). I think I’d still prefer a crop sensor for something like wildlife/bif during the day as something like a d500 + tamron 150-600 would be a killer combo (without mentioning the usual weight difference in favour of crop sensor systems, although Olympus is trying to prove otherwise). But I’m a sucker for this FF DOF, what can I say. Still, I disagree even to discuss this thing. You just take your photo and see of it’s good or not. I never ever think about equivalence when I am in the field. Never. This subject has been abused by Youtuber idiots and people who want to attract hits to their web sites (not talking about you). Wonderful article! This will definitely clear doubts of photographers about equivalence. I’ve seen curves that suggest the D500 and D7200 are ALMOST as good in their “ISO performance” as the D750. How do you reconcile this with the 2.25x multiplier? Does that mean they’re actually better? Or that the test is not under conditions of equivalence but just noise at a different absolute focal length and aperture? Maybe there should be an article explaining that ISO doesn’t mean what people think it means starting with changing “sensitivity” to what is actually recorded in a raw file. I really liked this article. I hadn’t understood how ISO fit into equivalence until reading this explanation. Bob: DxOMark’s ISO numbers are 2956 for the Nikon D750 and 1333 for the D7200. Dividing those two numbers gives a ratio of 2.22, which almost matches the 2.25 multiplier computed by Spenser. I appreciate you wrote this at the beginning. So I could skip the rest of the article. But I did not. I have just one question though: Is there really anyone who tries to copy a similar look? Why would anyone do so? 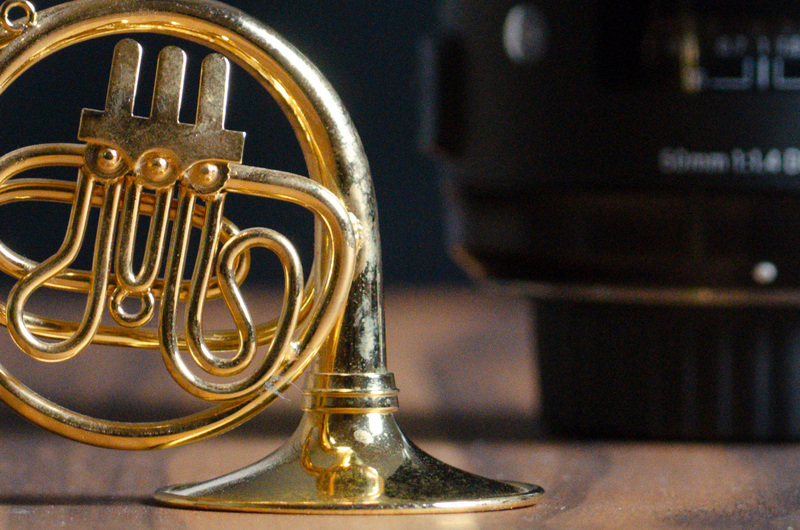 Wouldn’t your rather choose those settings on a specific camera which give the best result? E.g. you’ll never ever even get close to the look of an FF (or even MF) camera with a wide open (pro) lens on an APS-C body with any APS-C lens. So why bother? Umm; does it really matter that much Spencer? I don’t thinks so. Too many are too consumed by technical [gear] stuff they forget about the light; the qualities of the light; and the shadows from the light . Yes and Yes. Probably the D850 has a better IQ than Ansel’s large format….but does it matter. My small little Fuji that I can carry into the Mts gets the job done with great IQ and probably better than Ansel’s…..but what is important, all this math stuff or the image that you produce and enjoy? One of Zack Arias’s videos is quite coming to the point: Difference between FF and APS-C: NEGLIGIBLE. And that goes as well for the equivalencing game between the two groups of owners. Is a pixel today equivalent to a pixel from five or ten years ago? Is a pixel on a crop sensor equivalent to a pixel on a full-frame sensor? Equivalence is when the same amout of light is directed towards the sensor; at the same angle of view / field viewing angle. Now imagine the same (amount of) light concentrated on a narrower sensor –> sensor gets illuminated brighter (exactly as Spencer put it)! Example: sensor size = 0.5×0.5 original –> brightness level = 2×2 = 4. Now imagine the original sensor has 2×2 times bigger pixels, each pixel will catch the same amount of photons………..noise level will be the same at 4x higher amplification/ISO. …………………………………….. that’s all the magic! totally agree with Spencer, just want to share my philosophy why it’s all like this! Its all irrelevant. One chooses a camera and a lens. Mostly nowadays a zoom lens to make life easier. Yes even for professionals. 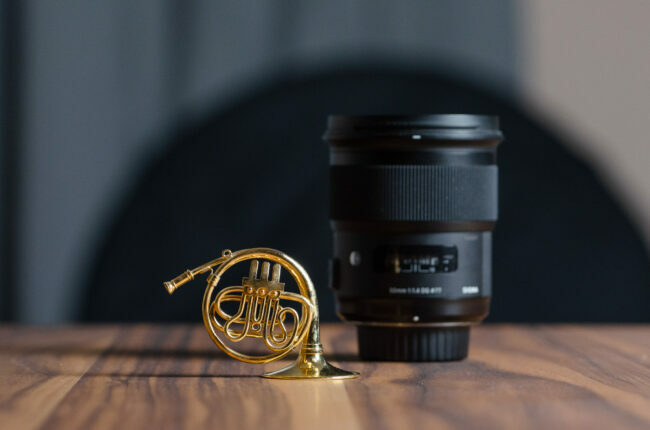 One picks up the camera and lens of choice for the session or day and sets the camera, frames the image taking into consideration any other tools such as flash, filters or whatever. If the desired image cannot be captured then change something like the lens or the other tools or the settings. even, gasp, position. Simples. But Hey. You can sit down behind a trailer of several hundred lenses and work out which is closest to the camera equivalent you had and fell in love with 20 years ago. The one you still have but don’t use. Equivalence is just a method of procrastination, the result of gas or ego. And total light…………in English. Crap. What about Fuji, don’t the exist in your world? Fabulous collection with the historical instrument.